The recent discovery of gravitational waves from the neutron star merger designated GW170817 is said to prove that heavy metals like gold are produced in this extreme environment and not in supernovae, as was long thought. The teams that discovered GW170817 put out an astonishing 76 papers all at once, including 5 on the subject of nucleosynthesis, all pointing to this conclusion. But how did it come about? 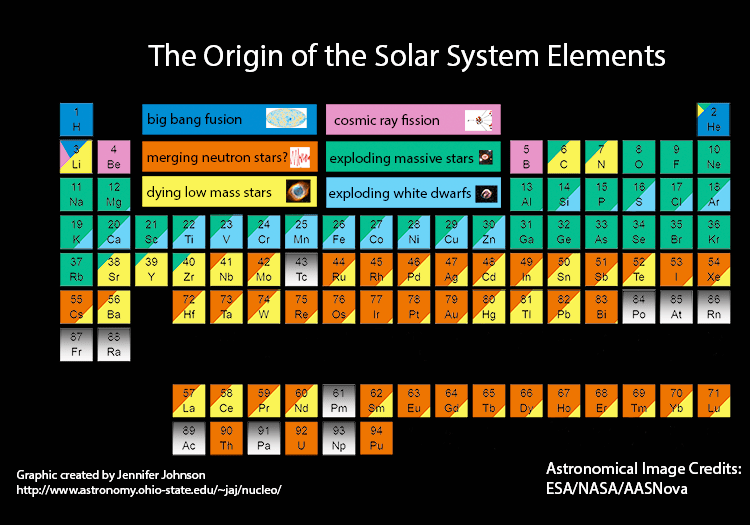 There are a number of different nuclear processes which create most of the elements of the period table, nearly all of which occur in different types of dying stars. In fact, out of all the elements, only carbon and nitrogen are predominantly created by the classical, orderly core fusion you’ll see in introductory textbooks. Elements lighter than carbon are created by various cosmic processes, while all of the other elements are predominantly created by stars in their death throes. Here is a handy guide from Jennifer Johnson of The Ohio State University. First off, some elements are created mainly in core-collapse supernovae—the exploding massive stars we all know and love. The oxygen in the air, the sodium and chlorine in the oceans, and many other crucial light elements like aluminum, silicon, and phosphorus are created in these stellar explosions by repeatedly adding alpha particles, or helium nuclei, to heavier nuclei. This is known as the “alpha-process” (not to be confused with the triple-alpha process, which burns helium into carbon), and it can continue until it hits zirconium (number 40), which the heaviest element for which an equal number of protons and neutrons is stable. Other elements, especially iron and nickel and those around them, are produced mostly by a different type of stellar explosion: Type Ia supernova, in which a white dwarf burns all of its carbon and oxygen mass to the lowest energy state, which is iron, in a single, massive flash. For heavier elements, however, a different process is needed, one that repeatedly adds neutrons to a nucleus. There are two ways this can happen. If it is slow enough, the nucleus will undergo beta decay with neutrons flipping to protons as needed before the next neutron is added. This is called the s-process, for “slow neutron capture process”, and it occurs in red giant stars, where certain nuclear reactions gradually produce neutrons. On the other hand, if the neutrons are added very fast, as many of them as possible will be dumped onto a nucleus all at once and then decay. This is called the r-process, or “rapid neutron capture process”. For a long time, it was thought that the immense energy of core-collapse supernovae was the site of the r-process, but in recent years, scientists have done the calculations and decided there just aren’t enough neutrons there. An alternative hypothesis was that the r-process occurs in places where there are way more neutrons than even a supernova (for obvious reasons): the collision of two neutron stars. At first glance, this is not obvious. Neutron star mergers are much rarer than supernovae. But they also produce a lot more heavy elements. Calculations suggested that it might be enough to explain all of the r-process elements in the universe. So that’s the theory, but how can we prove it? How do we know the debris from this neutron star collision was really r-process material and not something else? Well, if you look at the chart, you can see that the r-process and the s-process produce different elements. The r-process creates all elements heavier than iron more or less equally, while the s-process tends to pile up around elements that have “magic numbers” of nucleons, which are especially stable. These includes elements like strontium (50 neutrons), tin (50 protons), barium (82 neutrons), and lead (82 protons). Elements in the gaps between the s-process elements like silver, iodine, europium (a rare earth metal used in TVs), gold, and uranium are produced almost exclusively by the r-process and are much rarer and more valuable because of the rarity of their sources. It’s no coincidence that silver, gold, and platinum all fall in this category. So if we see an element that is made only by the r-process, it’s pretty clear that is what’s really going on. As it happens, europium is one of the easiest elements in this category to observe. Astronomers looked for the signature of europium in the spectrum of this neutron star merger, and they found lots of it. In fact, they found enough to potentially explain all of the r-process elements in the universe, like the theory says, although it’s not certain yet. Continued measurements of neutron star mergers like this one will allow us to estimate what fraction of gold and other rare elements came from this exotic source. In the end, it really is a detective story. The gravitational wave proves that it is definitely a neutron star merger. The fact that it was associated with the known kilonova phenomenon proves that these cosmic light shows are also neutron star mergers. And the spectral signature of europium proves that the r-process is going on there, which is also the source of gold. And the amount of europium observed proves that these are very likely the main source of gold in the universe, as all the articles have been quick to point out. This entry was posted in astronomy, Space and tagged gravitational waves, neutron star, nuclear physics, supernova. Bookmark the permalink.